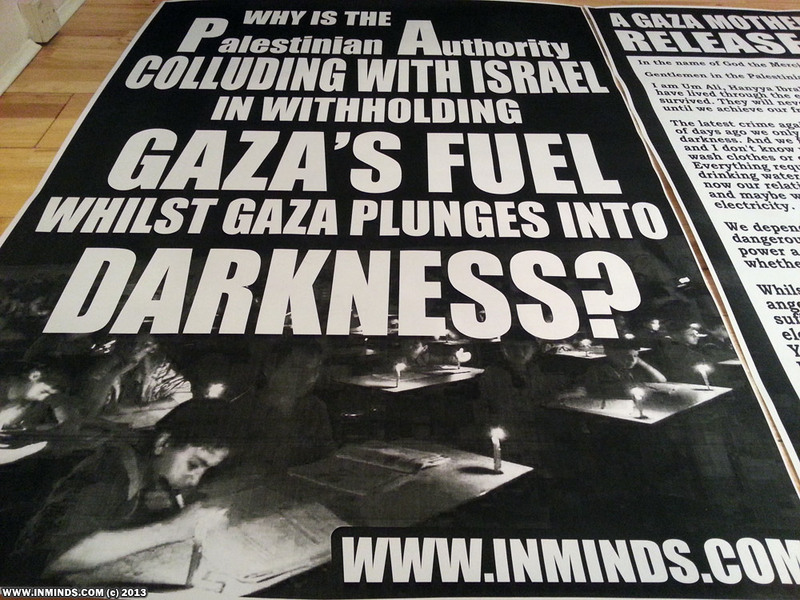 On Wednesday 13th November 2013, a dozen human rights activists held a vigil, organised by the campaign group Inminds.com, outside the Palestinian Mission in London to protest against the barbaric siege imposed on the Gaza strip and in particular the Palestinian Authority's role in the current fuel crisis which has left Gaza without electricity for 18 hours a day. 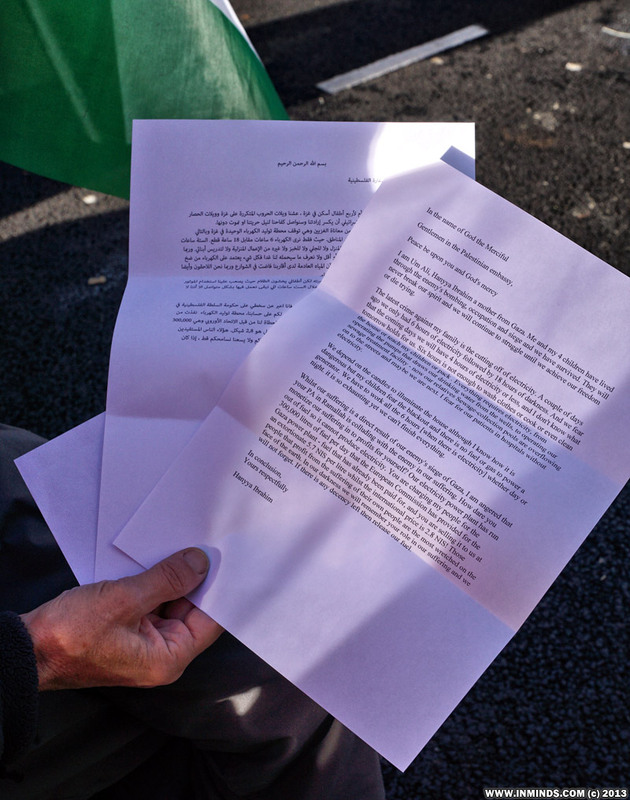 They delivered a letter from a Palestinian mother from Gaza to the Palestinian Authority (PA) demanding that the PA release the fuel provided by the EU for Gaza. 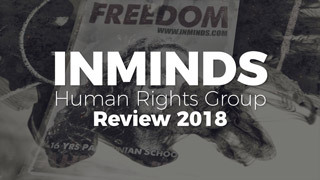 Abbas Ali from Inminds stressed "We want to reiterate that we understand that this is not the solution to the problem but just a band aid to help with the immediate crisis, any real solution requires Israel to be brought to book for its illegal occupation and its responsibilities under international law which include providing the whole of Gaza with electricity." 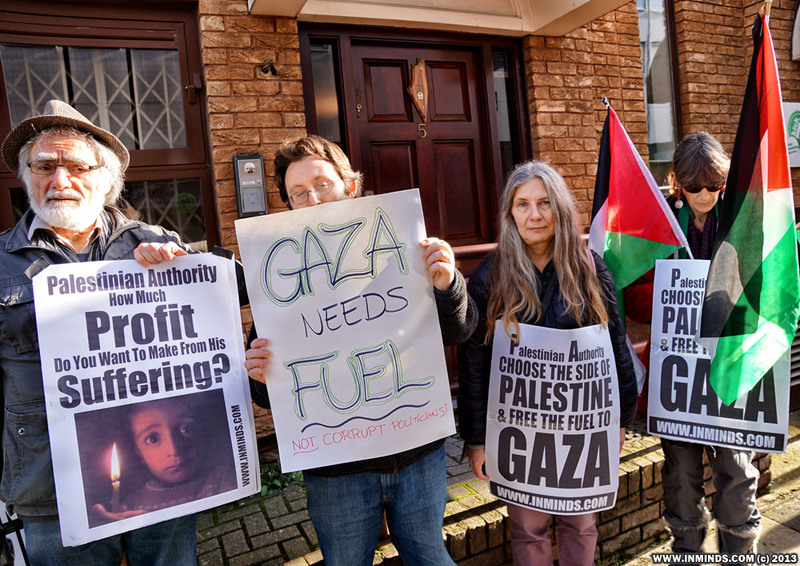 As the occupying power, Israel is directly responsible under international law to ensure Gaza's humanitarian needs including electricity are met. 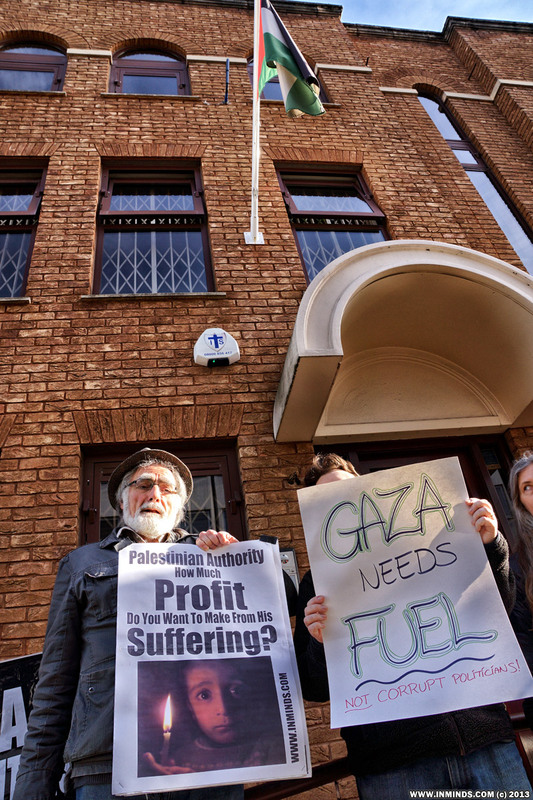 Yet Israel has never fulfilled its legal obligations and has as part of its deliberate policy of slow genocide cut the amount of electricity it sells to Gaza, so today it only provides 120MW of electricity whilst Gaza requires 420MW to survive in winter. 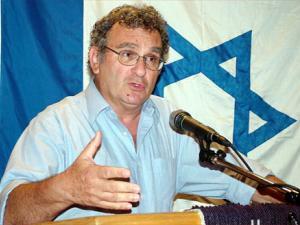 So the blame for the current crisis in Gaza and the suffering it is causing must squarely fall on Israel. To make up a fraction of the short fall, Gaza generates electricity from its sole power plant, but Israel doesn't allow the Gaza power plant to operate at 100%. 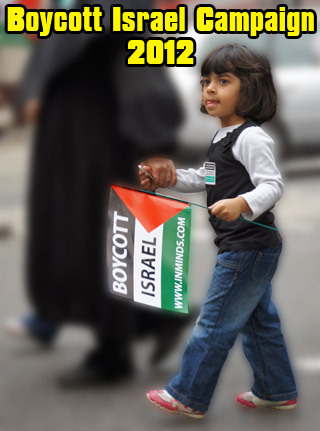 In June 2006 Israel bombed the power plant, specifically targeting its six transformers, when two of the missiles missed their target Israel fired two more missiles to ensure all the transformers were destroyed. 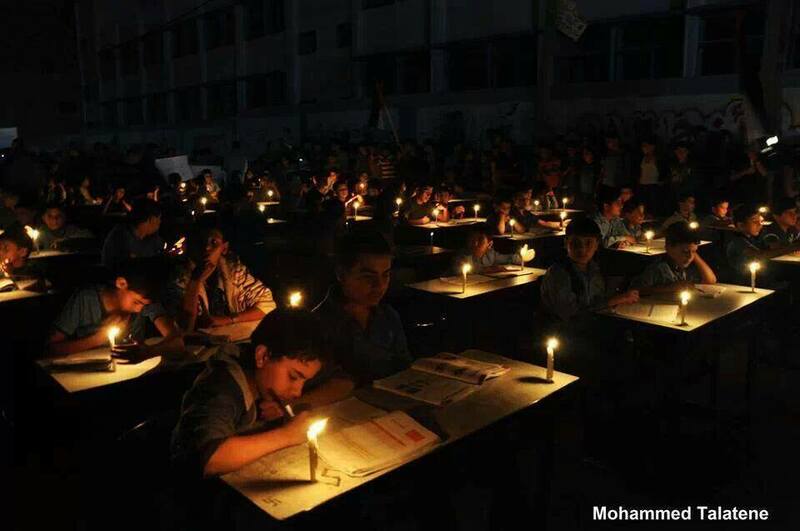 With the heavy restrictions on what Israel allows in to Gaza it's been a slow process of repair to get the power plant working again, and before the current fuel crisis the Gaza power plant was producing just a fraction of its capacity - between 40-65MW of electricity. 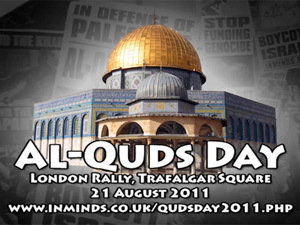 And even that meagre amount has come to an end since the coup in Egypt with the coup regime destroying on a mass scale the tunnels from Egypt to Gaza which had survived previous Egyptian attempts to destroy them and had brought life saving fuel to Gaza. The power plant needs 650,000 litres fuel per day to operate fully. 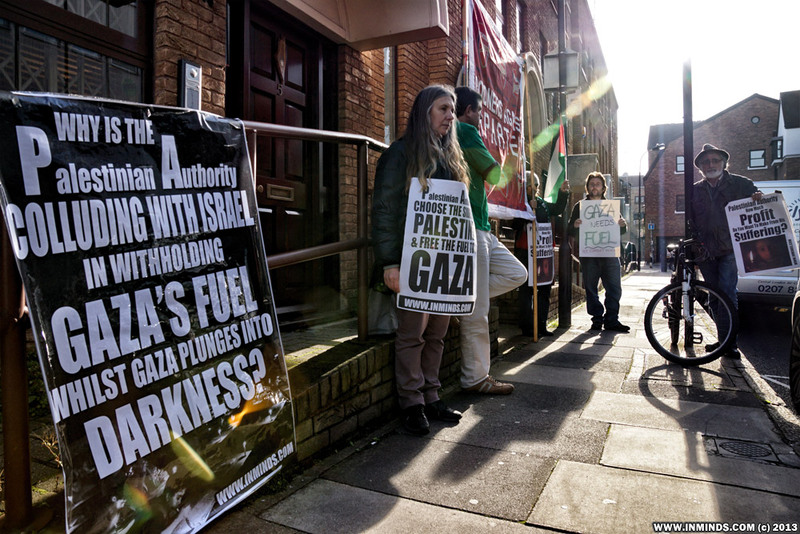 With all other supplies cut off, the EU fuel is of central importance in alleviating Gaza's immediate suffering. 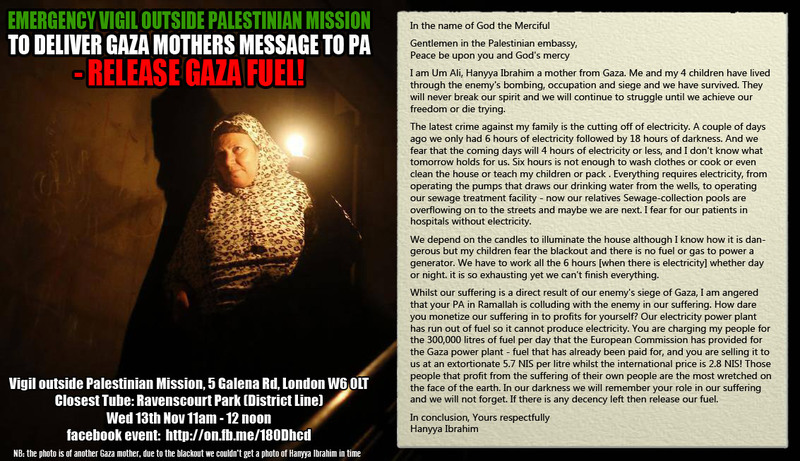 Hanyya Ibrahim, a Palestinian mother of four, wrote "A couple of days ago we only had 6 hours of electricity followed by 18 hours of darkness. And we fear the coming days.. I don't know what tomorrow holds for us. Six hours is not enough to wash clothes or cook or even clean the house or teach my children... Everything requires electricity, from operating the pumps that draws our drinking water from the wells, to operating our sewage treatment facility - now our relatives Sewage-collection pools are overflowing on to the streets and maybe we are next. I fear for our patients in hospitals without electricity. We depend on the candles to illuminate the house although I know how dangerous it is but my children fear the blackout and there is no fuel or gas to power a generator. We have to work all the 6 hours [when there is electricity] whether day or night. 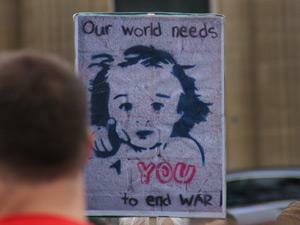 it is so exhausting yet we can't finish everything." 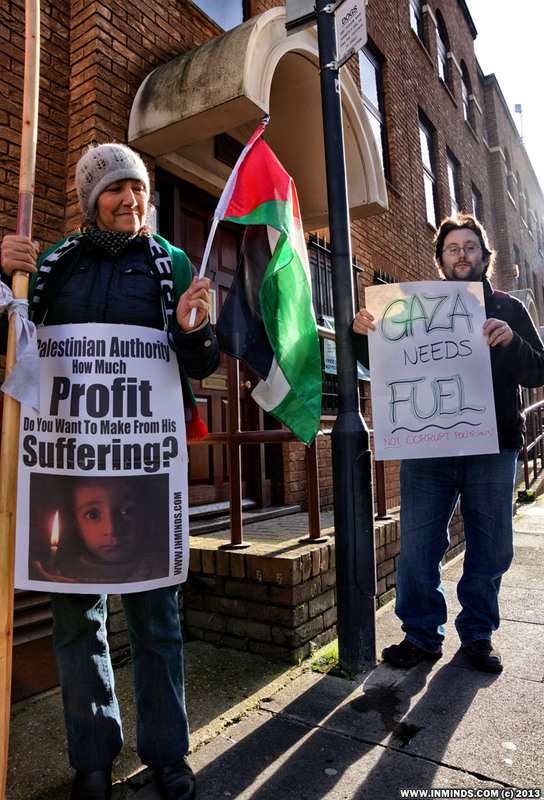 The European Union for its part, rather than hold Israel accountable and sanction it for not fulfilling its legal responsibilities to Gaza as the occupying power, decided instead to help alleviate Israel's financial burden of occupation by chipping in to pay for some of the fuel costs for the Gaza power plant. Ahmad Abu Alamreen, Head of Energy Information Center in Palestinian Energy & Natural Resources Authority, revealed that "The EU provides 300,000 litres of fuel per day for Gaza, this amount used to be directly transferred to Gaza but after the intervention of Ramallah Palestinian Authority politician Salam Fayyad the money is now transferred to the PA treasury." 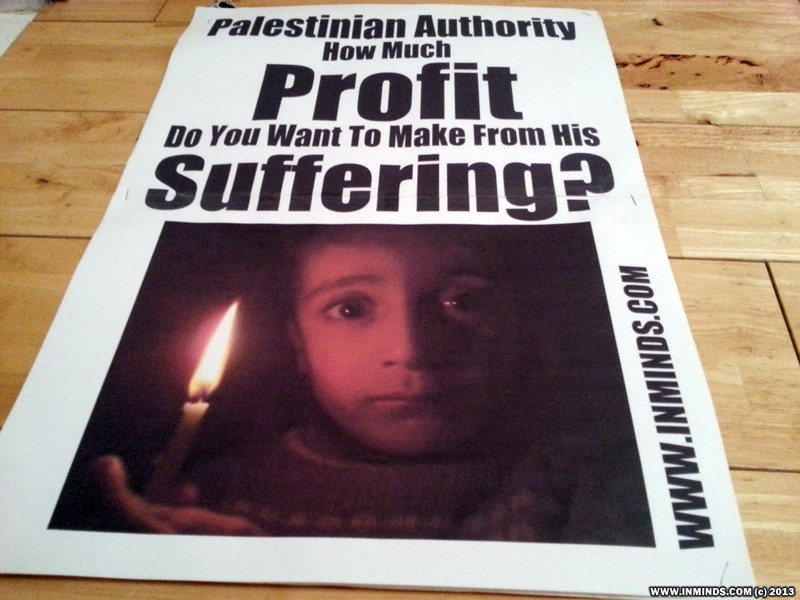 Having pocketed the money the Ramallah PA has stopped transferring the fuel to Gaza. 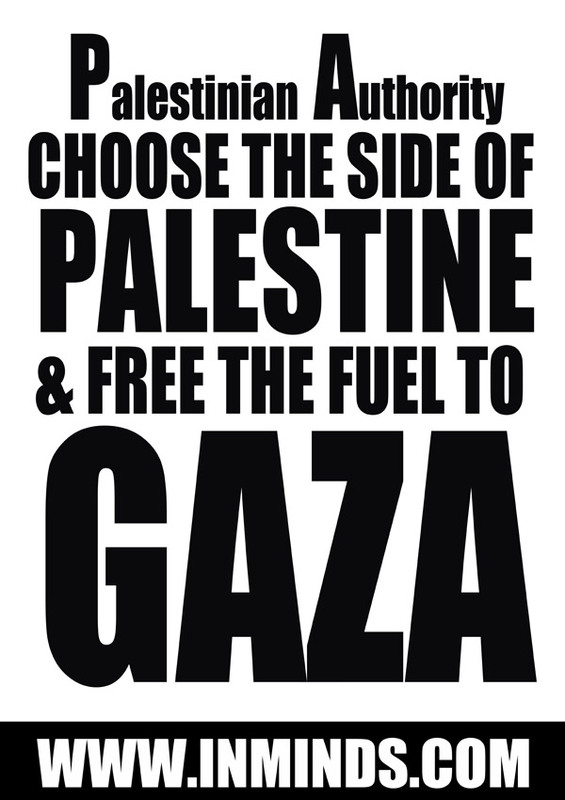 Instead it wants to sell the fuel, which has already been paid for, to Gaza. To make matters worse it wants to sell it at an extortionate rate. Whilst the international price for fuel is 2.8 NIS (which is the rate the PA buys the fuel from Israel), the PA want to charge Gaza a ridiculous 5.7 NIS! 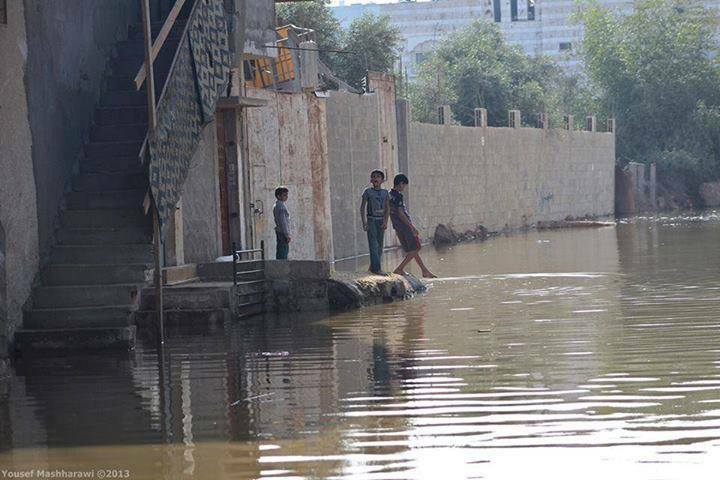 No government in the world , let allow a small enclave under a genocidal siege can afford to pay such an amount. 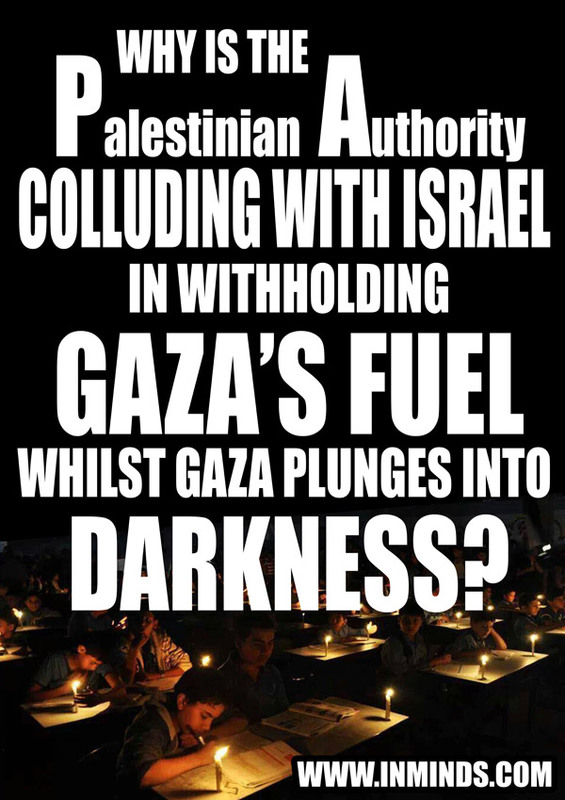 "Why is the Palestinian Authority colluding with Israel in withholding Gaza's fuel whilst Gaza plunges into darkness?" 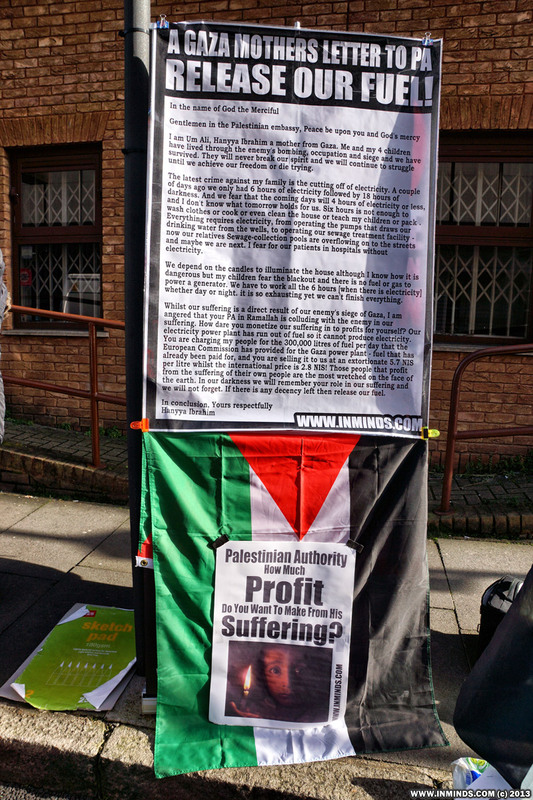 read the main banner of the vigil. 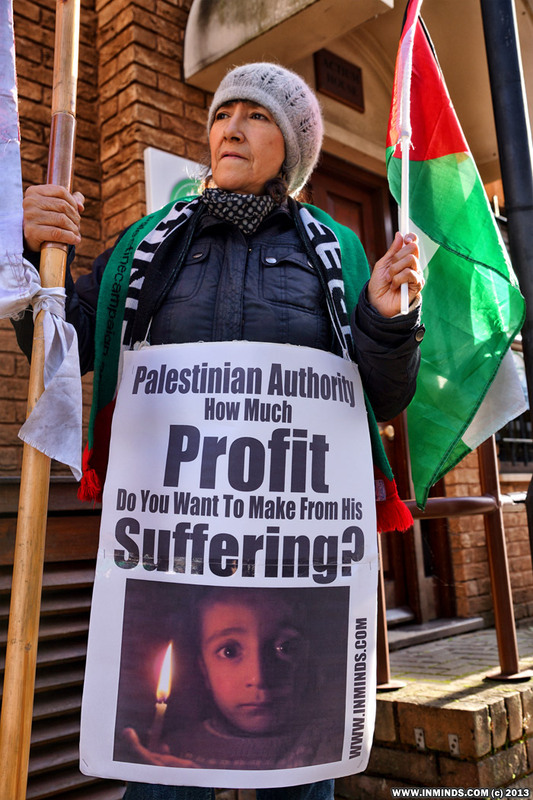 Activists held placards with messages "Palestinian Authority choose the side of Palestine & free the fuel to Gaza " and "Palestinian Authority how much profit do you want to make from his suffering?" 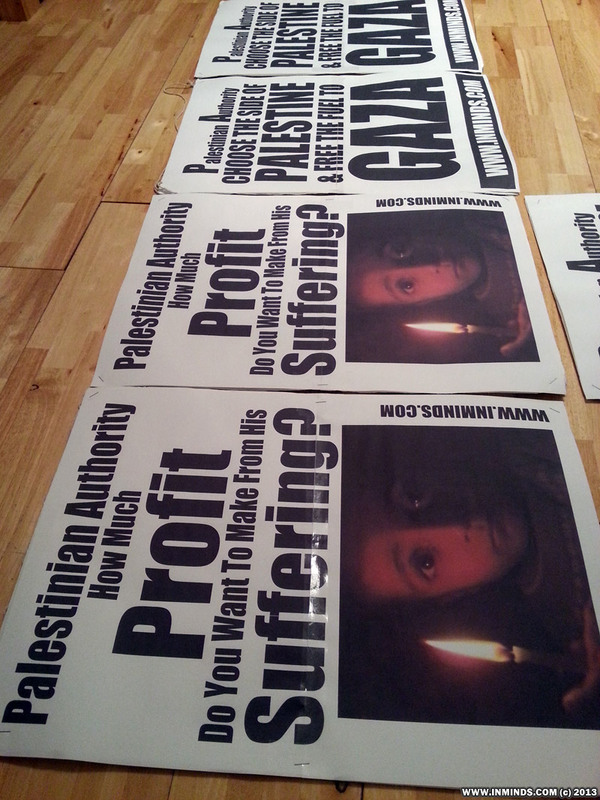 with a photo of a Gazaan child holding a candle during a blackout. 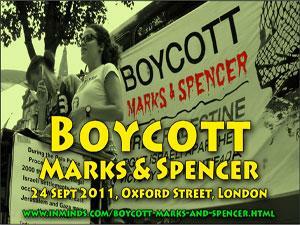 Michael Heart's song dedicated to Gaza "We Will Not Go Down" played in the background. 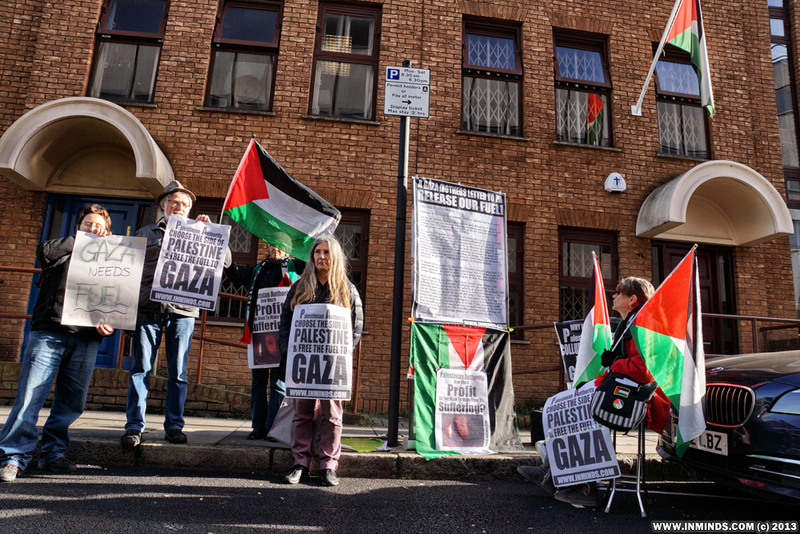 The Palestinian Mission faces a school, about a dozen school children accompanied by their teacher came out at break time to learn firsthand about the siege of Gaza. 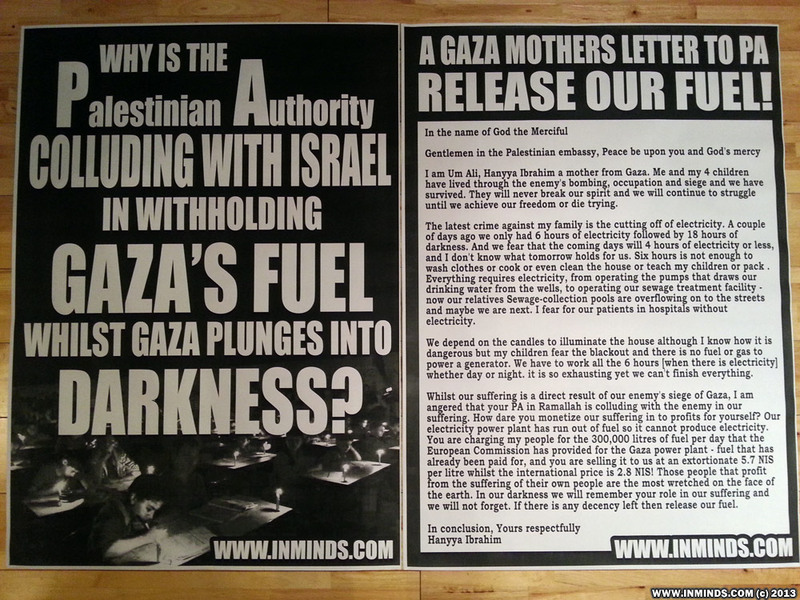 A giant poster of the letter from Gaza was on display outside the embassy door. 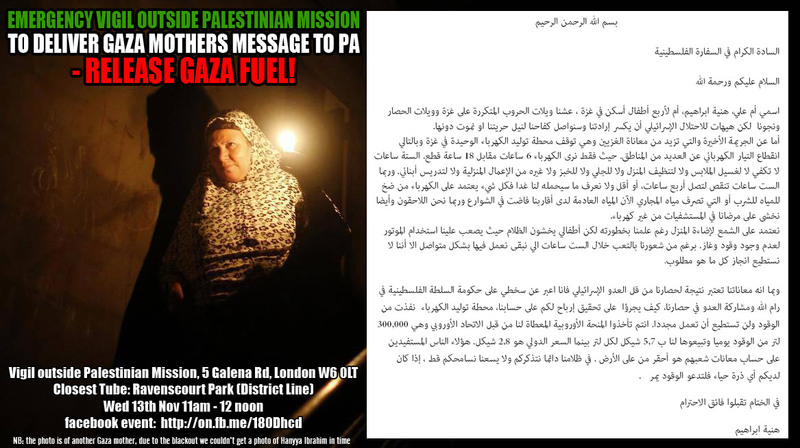 The mother's passionate message condemned the PA: "Whilst our suffering is a direct result of our enemy's siege of Gaza, I am angered that your PA in Ramallah is colluding with the enemy in our suffering. 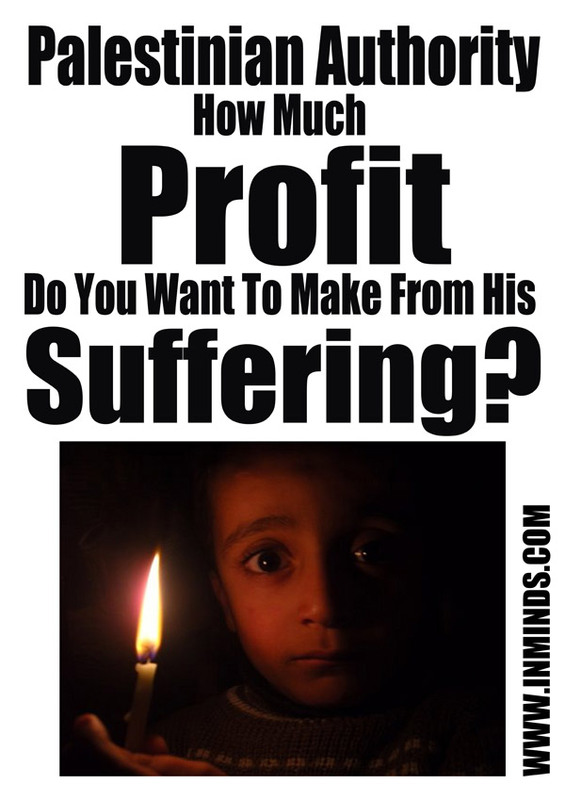 How dare you monetize our suffering in to profits for yourself? Our electricity power plant has run out of fuel so it cannot produce electricity. 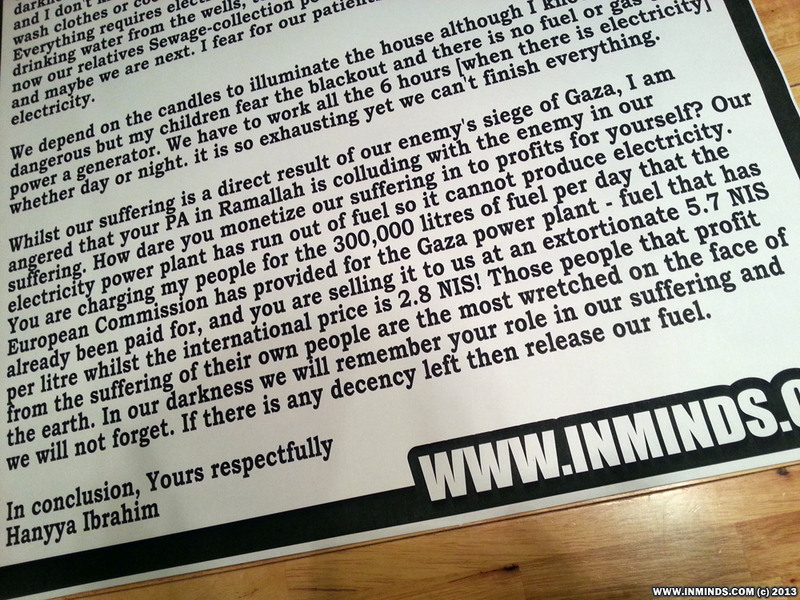 You are charging my people for the 300,000 litres of fuel per day that the European Commission has provided for the Gaza power plant - fuel that has already been paid for, and you are selling it to us at an extortionate 5.7 NIS per litre whilst the international price is 2.8 NIS! 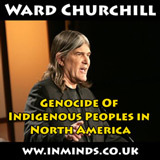 Those people that profit from the suffering of their own people are the most wretched on the face of the earth. In our darkness we will remember your role in our suffering and we will not forget. If there is any decency left then release our fuel." 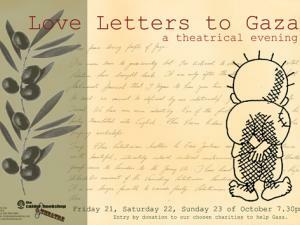 The letter was received by Palestinian consul Ahmed Mansur. 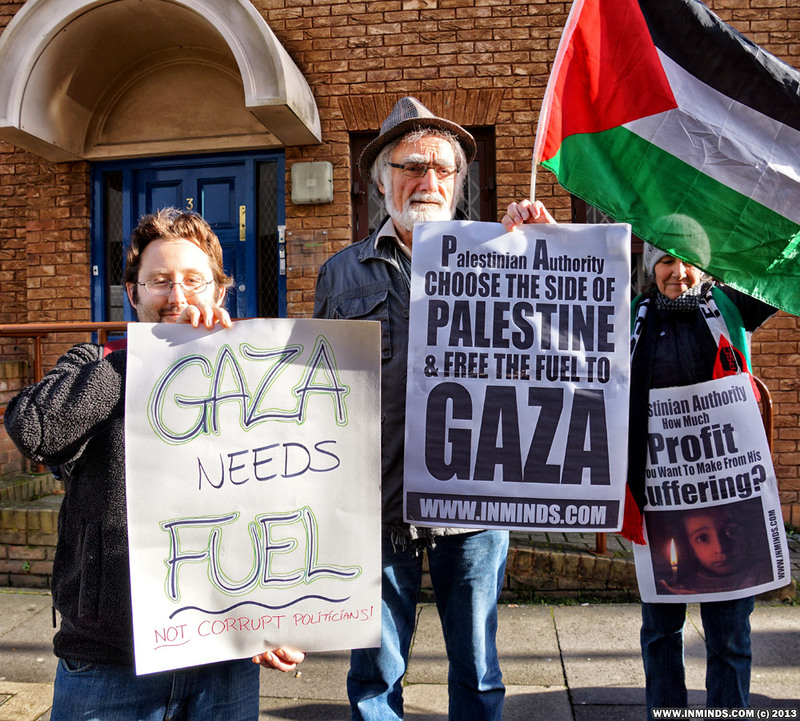 Mr Mansur initially deflected the PA's responsibility suggesting that the 300,000 litres of fuel the EU was paying for was designated for the West Bank and not for Gaza. 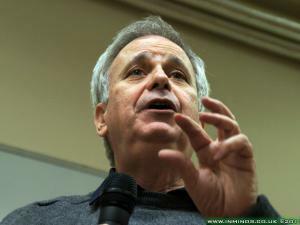 After he was reminded that the EU was providing 2 million litres of fuel per day for the West Bank which was separate from this 300,000 litres which was specifically designated for Gaza, he suggested that the "the rulers of Gaza Strip" were to blame as they "don't want to co-operate with PA and are taking advantage of the suffering". 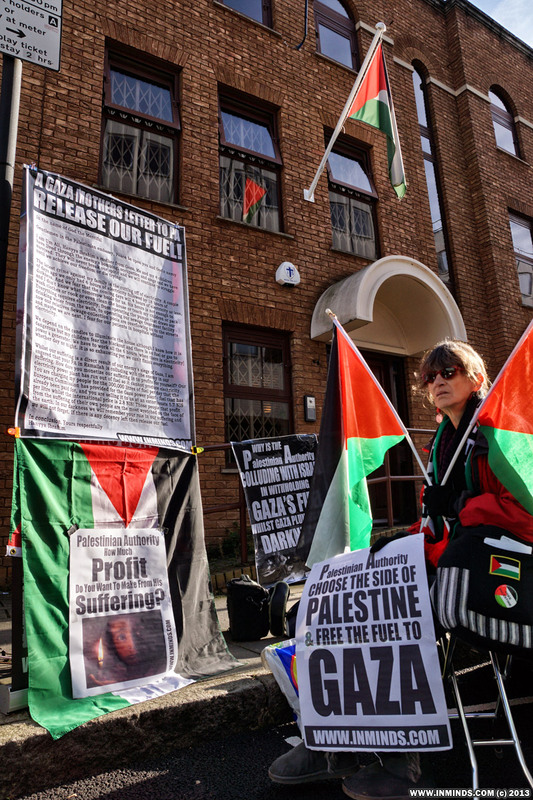 Ken O' Keefe, who accompanied the activists, asked for clarification "if it's not true that the PA in Ramallah has received the funds and therefore the fuel allocated for Gaza, if this is not true then it needs to be corrected. But if indeed the PA in Ramallah has received the funds for 300,000 litres of fuel that is desperately needed in Gaza right now, and the PA in Ramallah is not transferring that fuel or those funds, if that be the case.." to which Mr Mansur interjected "that is not the case , it's not a financial problem to send the money, the problem is the Israeli willingness to allow the fuel to go". When this was put to Ihab Al Ghusain, Spokesman for the Government in Gaza, he explained that this was not true "the main problem is the Ramallah government imposed taxes [ hiking the price from 2.8 to 5.7 NIS], before imposing these taxes we bought 600,000 litre of fuel from the PA just a month ago and it reached Gaza without any hindrance". 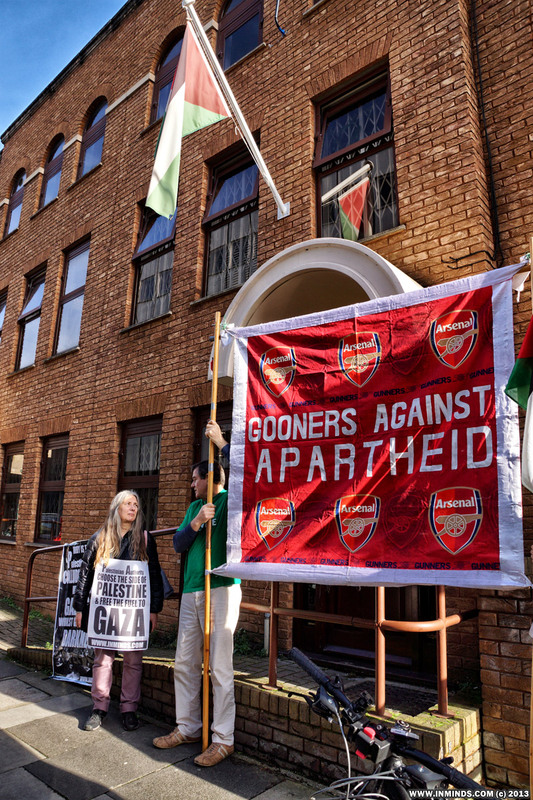 Mr Mansur went on to say the PA was paying the salaries of 70,000 officials in Gaza, costing them 45% of their budget, and if they stopped this it would cause a huge problem for the government in Gaza. What he failed to mention is that in order to try and bring the elected Hamas government to its knees the PA ordered all its civil servants in Gaza to stop working and go home on full pay, hoping that would cause the civil infrastructure to collapse. Hamas managed with the help of Iranian money to find replacements for all those 70,000 workers that had abandoned their posts and Gaza survived. So now the PA is forced to continue providing the salaries for those 70,000 employees even though they are just sitting at home. Mr Mansur also omitted to mention that since the electricity crisis began the PA has started to deduct 170NIS from the salaries of each of those 70,000 employees for electricity and yet it's not providing them any electricity. Hours after the protest, photos and videos emerged of rivers of raw untreated sewage flowing down streets in some neighbourhoods of Gaza after a sewage pumping station stopped working due to lack of electricity. 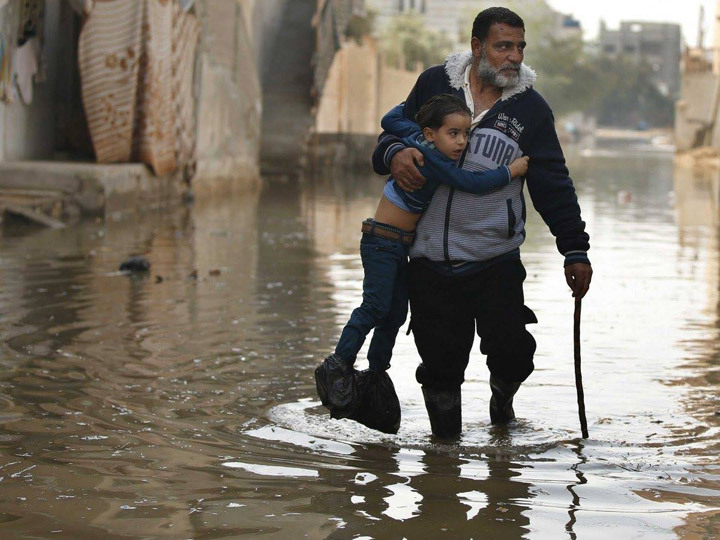 Life in Gaza is becoming unbearable and if nobody acts, the world will witness a flood of dead people either drowning in sewage water, or dying in power-less hospitals, and Gaza will be a curse upon everyone who didn't help.